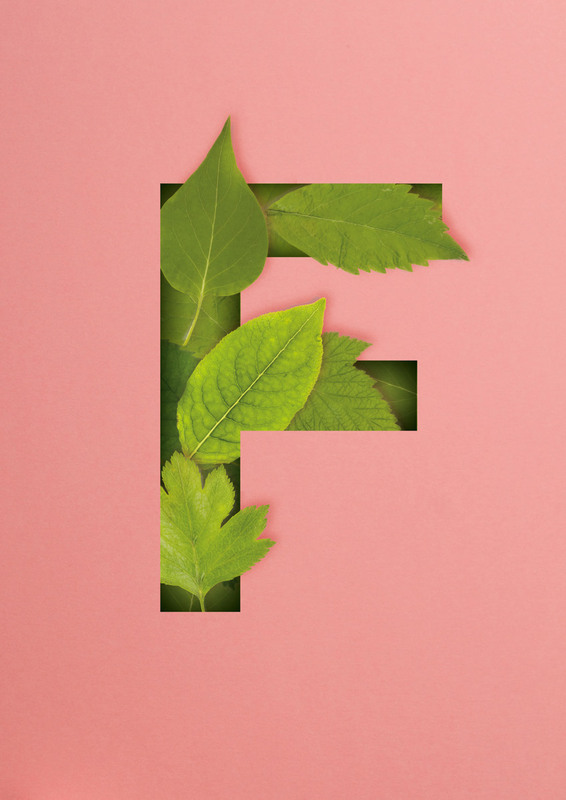 Often seen across advertising and poster artwork, this eye-catching effect gives an immersive, natural look to any letter. 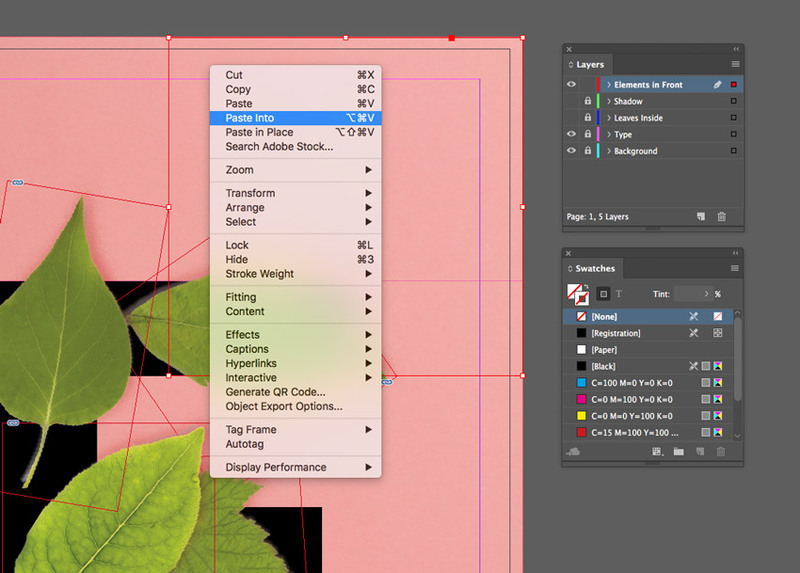 As well as being a quick tutorial, this is also a great introduction to some more advanced techniques in Adobe InDesign. Open up Adobe InDesign and go to File > New > Document. You can set up your page to any size, but here I’ve set it up as Portrait A3. When you’re ready, click Create. 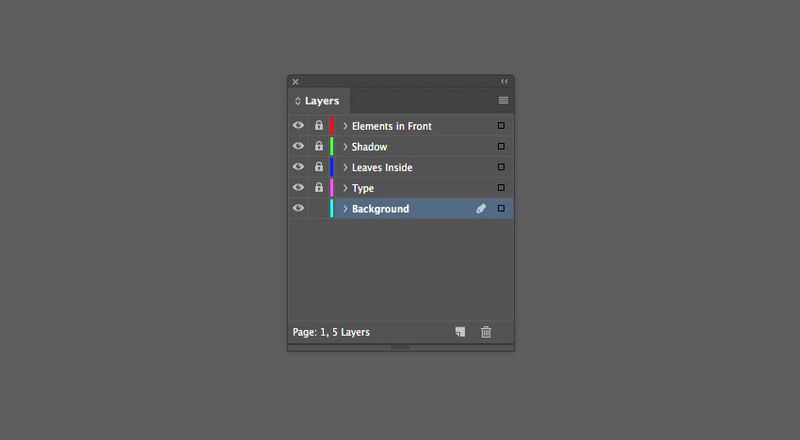 Expand the Layers panel (Window > Layers) and double-click on Layer 1 to rename it as Background. 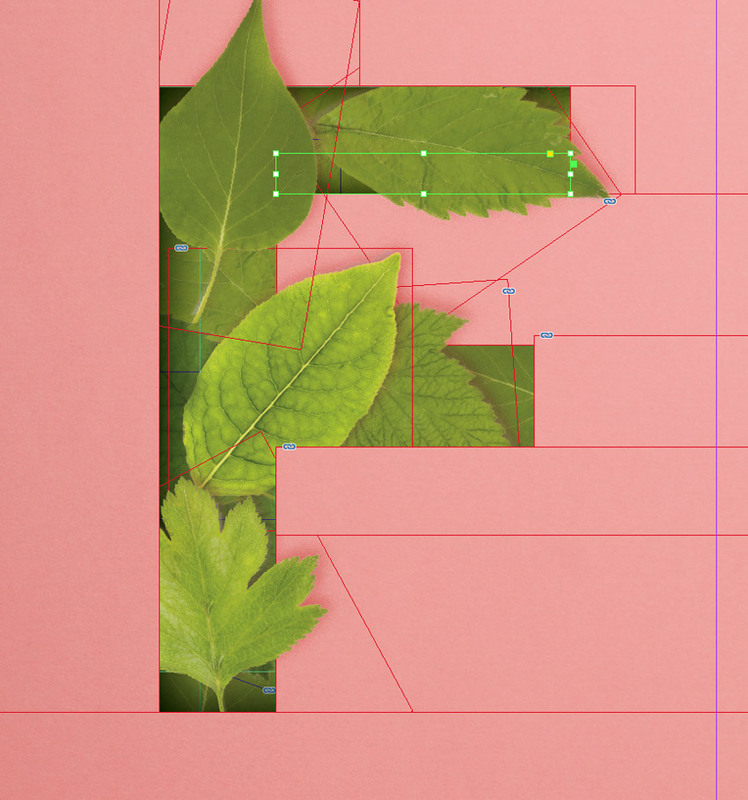 Create four new layers above this, in this order: Type, Leaves Inside, Shadow, and finally Elements in Front at the top. Then lock all layers except Background. 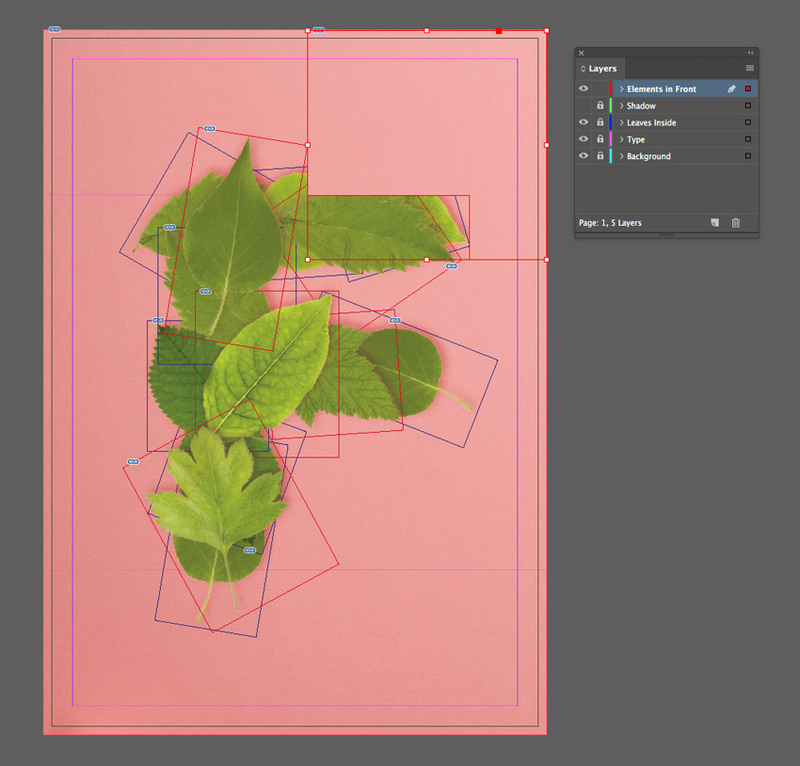 Use the Rectangle Frame Tool (F) to create an image frame across the whole page. 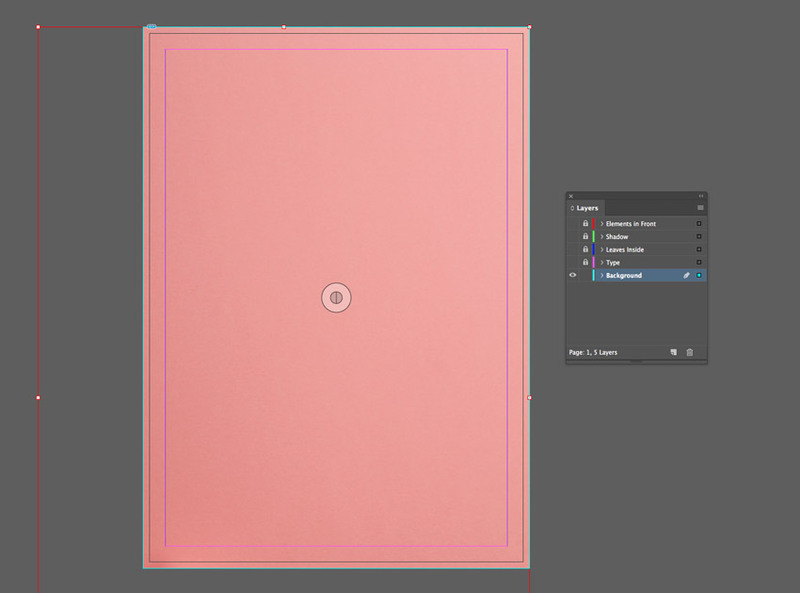 File > Place, navigate to the pink paper background image, and click Open, allowing it to fill the frame completely (without the gift box in the corner visible). 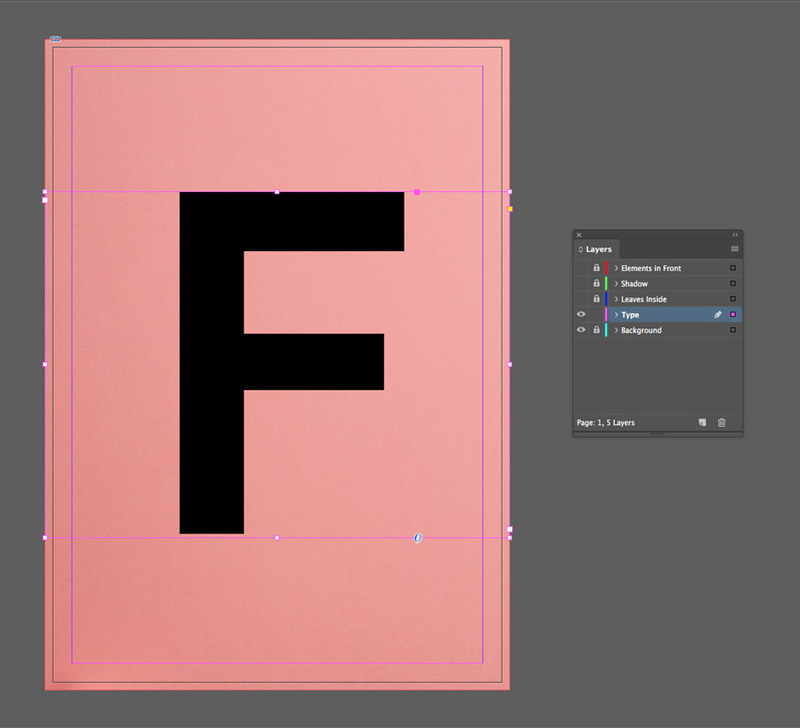 Create a large text frame on the page using the Type Tool (T), and type in a single letter*. From the Controls panel at the top of the workspace, set the Font to Nista International Bold, and make the Font Size nice and generous. * Note that this effect works much better with completely angular letters, like ‘F’, ‘L’, and ‘T’, but is much trickier to achieve with letters with rounded elements like ‘O’ or ‘P’. 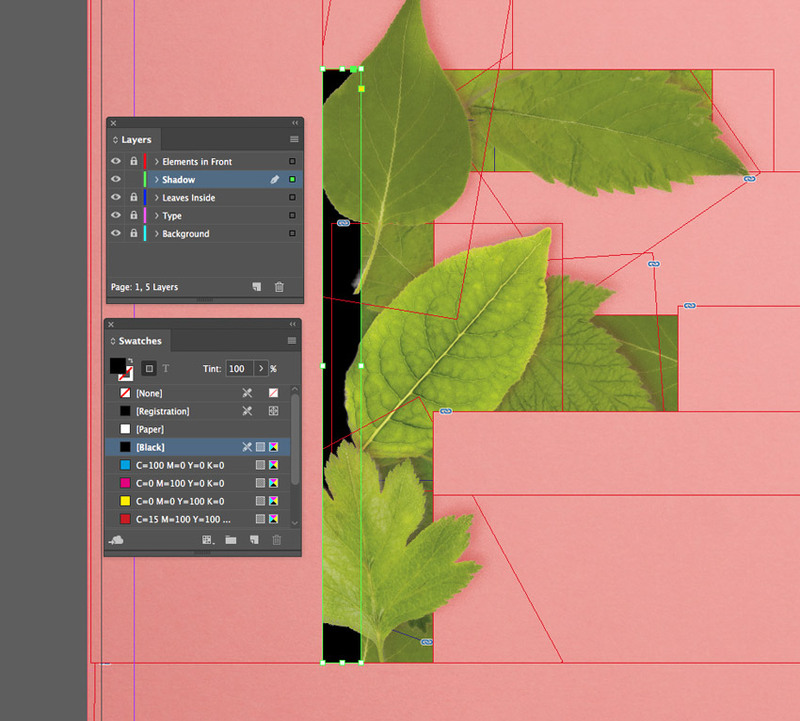 Minimize the InDesign window briefly and open up the green leaves image in Photoshop. Duplicate the Background layer to preserve a copy of the original image, and switch off the visibility of the original layer. Go to Select > Color Range and click anywhere onto the white background of the image. In the Color Range window that opens, increase the Fuzziness slider until most of the white is selected. Then click OK.
Click on the Refine Edge button on the top Controls panel, and check Smart Radius. Increase the Radius and Shift Edge sliders until you’re happy with the accuracy of the selection. Then click OK and hit Delete on your keyboard to delete the white area. Use the Lasso Tool (L) to isolate one of the leaves on the image, and then Edit > Copy the selection. 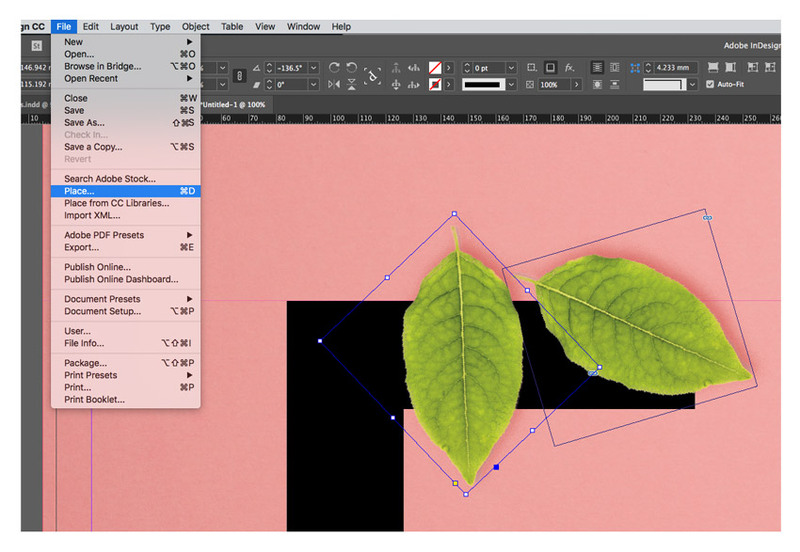 Create a new Photoshop document, and Edit > Paste the leaf onto this new canvas. 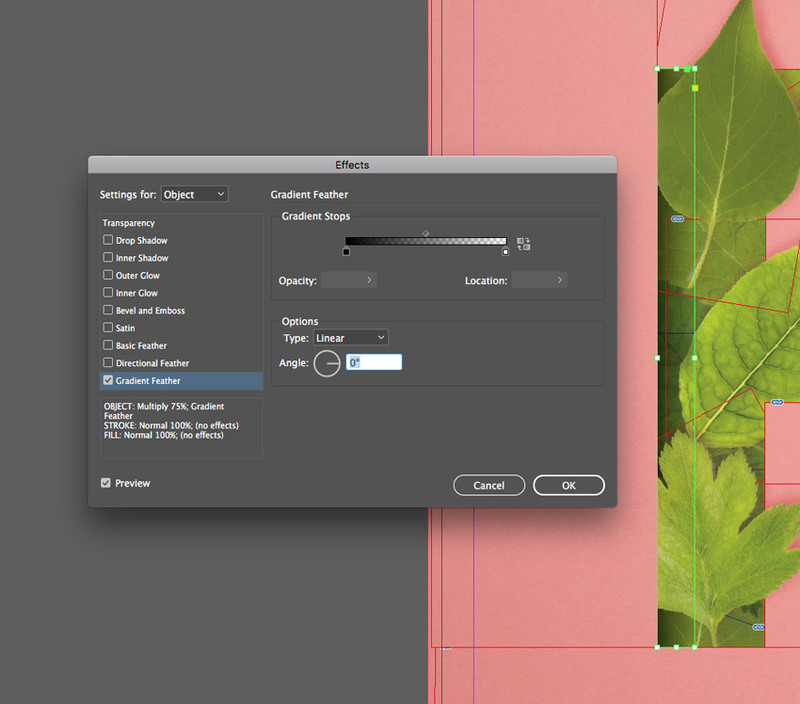 Switch off the visibility of the Background layer and then File > Save As the document as a Photoshop (PSD) file. 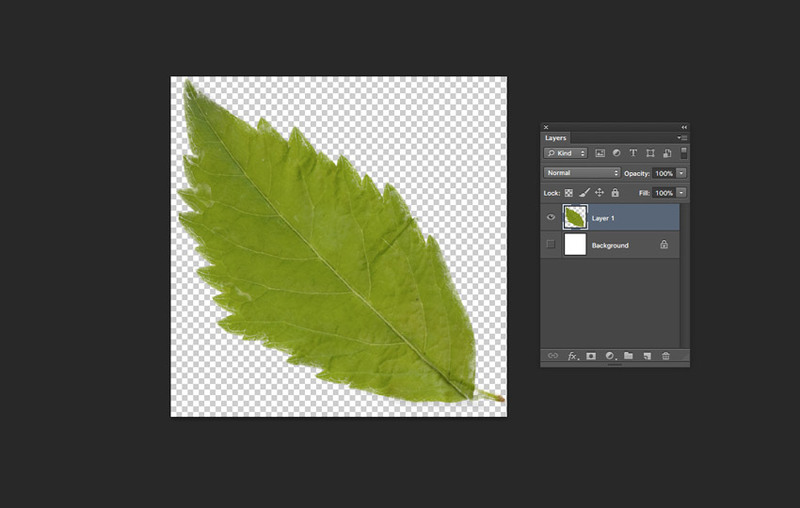 Name it ‘Leaf1.psd’. 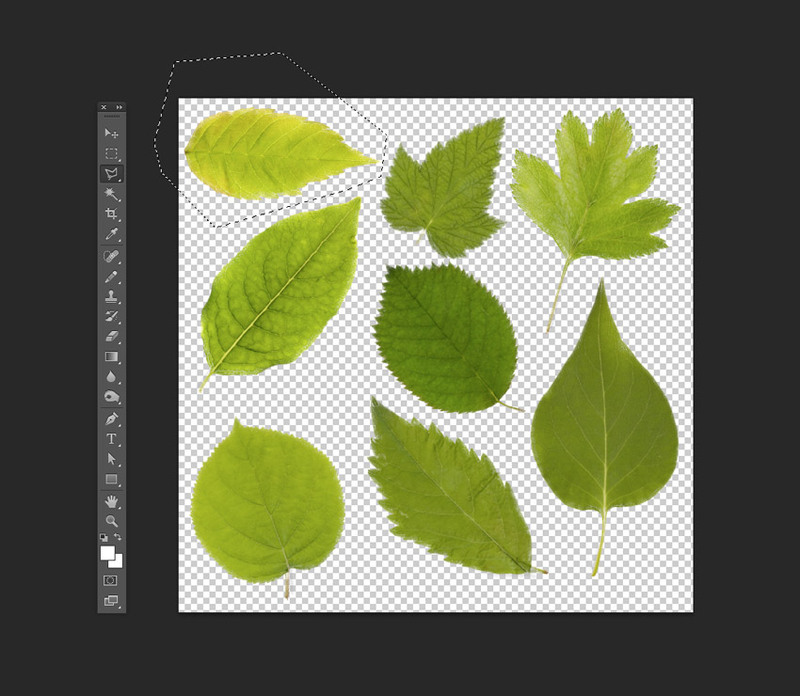 Repeat the process for each leaf, looping it off, copying and pasting it onto a new document, switching off the Background layer, and saving it as an individual Photoshop file. 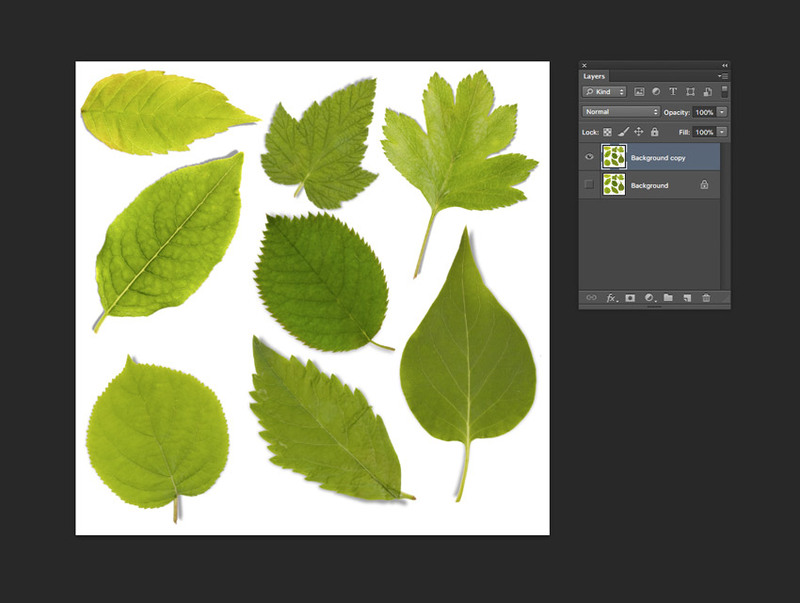 Name each leaf image in a sequence, e.g. 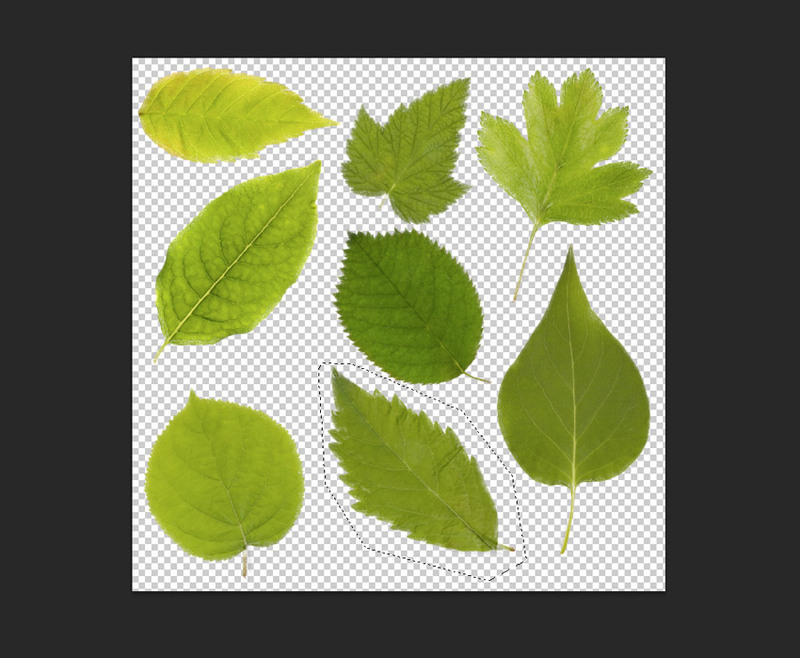 ‘Leaf2.psd’, ‘Leaf3.psd’, etc. 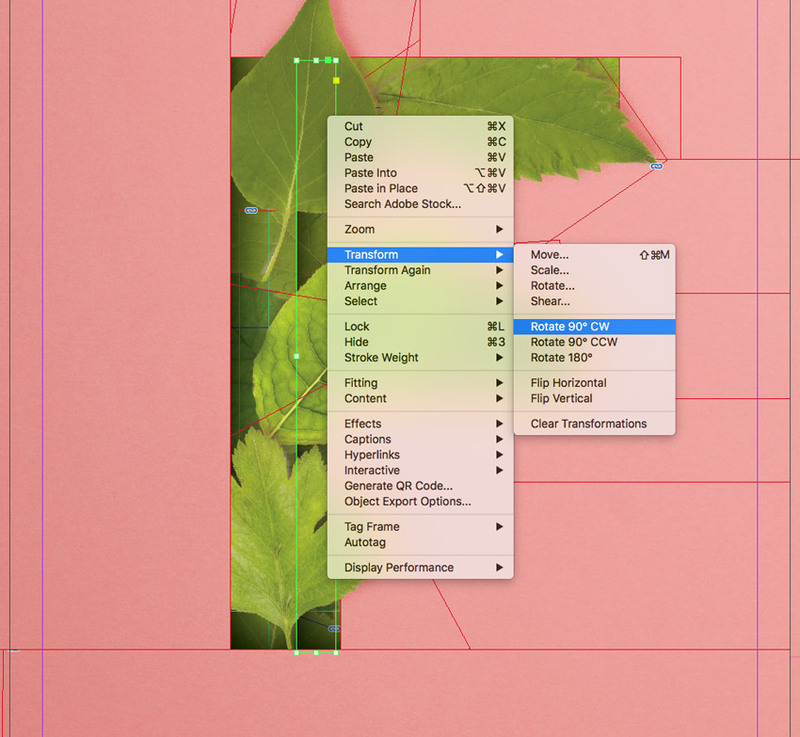 When you’ve saved all the leaves as Photoshop files, head back over to your InDesign document. 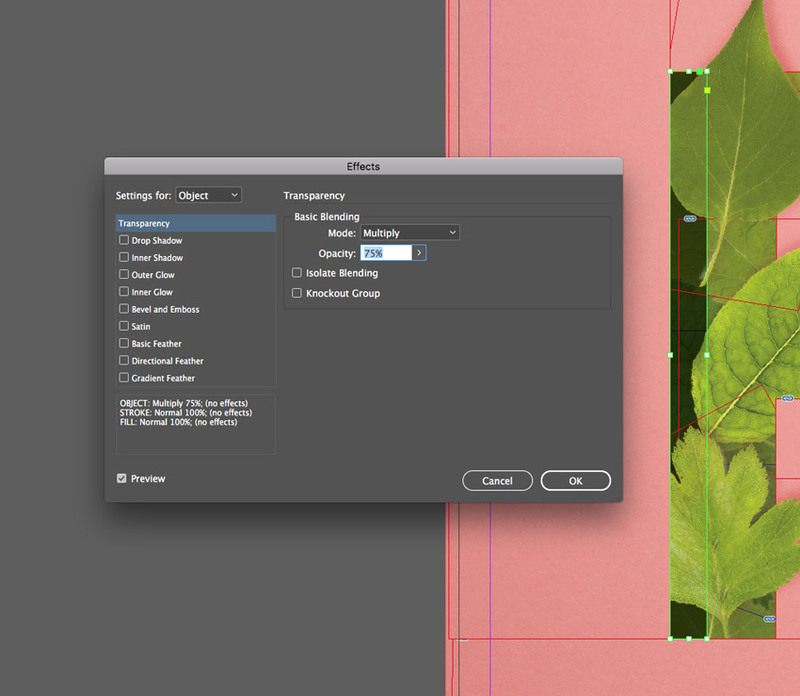 Lock the Type layer and unlock the Leaves Inside layer above. 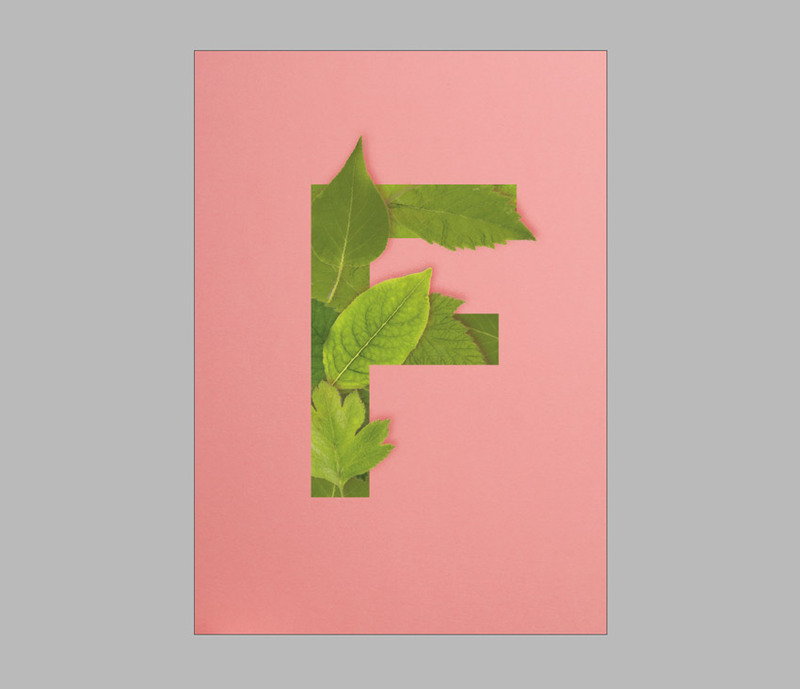 Use the Rectangle Frame Tool (F) to create a small frame somewhere over the top of your letter. 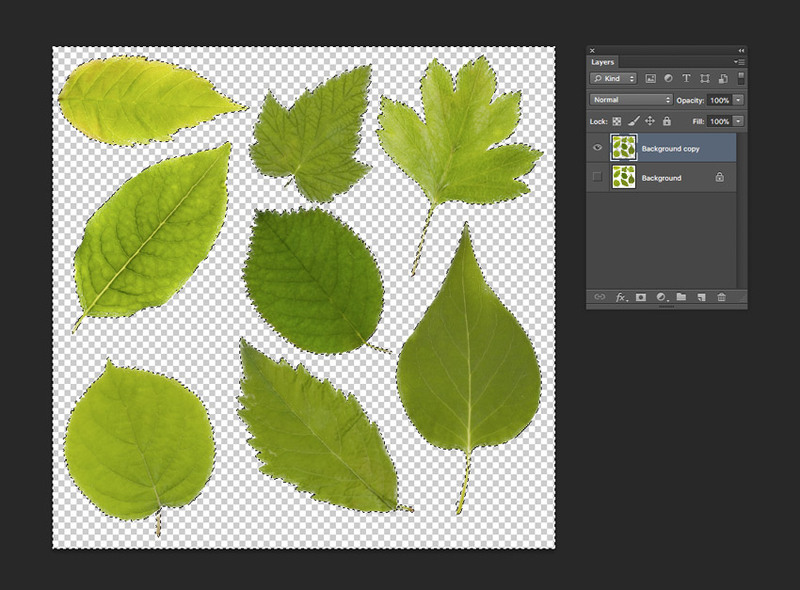 Go to File > Place, choose one of your leaf images, and Open. With the image frame selected, go to Object > Effects > Drop Shadow. 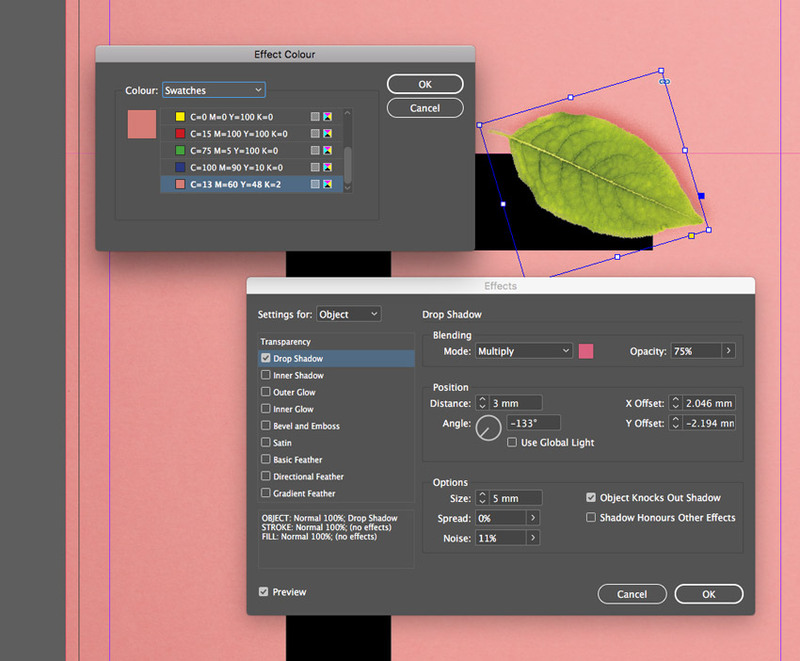 Switch the Effect Color to a pink swatch (here, I’ve added a new CMYK swatch from the Swatches panel, C=13 M=60 Y=48 K=2, beforehand, to make a good match to the pink paper background), and adjust the options in the Effects window until you have created a subtle shadow for the leaf. 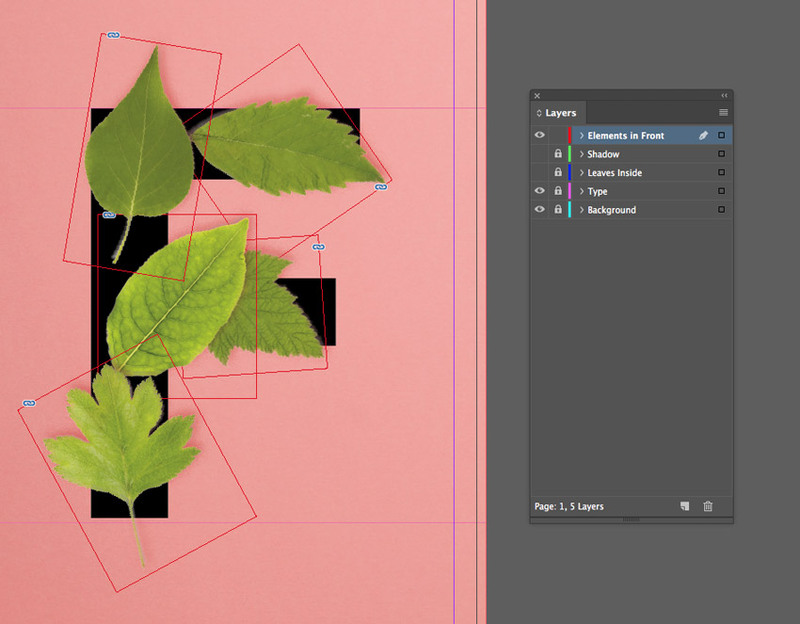 Select the leaf’s image frame and Edit > Copy, Edit > Paste, moving it over to cover another section of the letter. 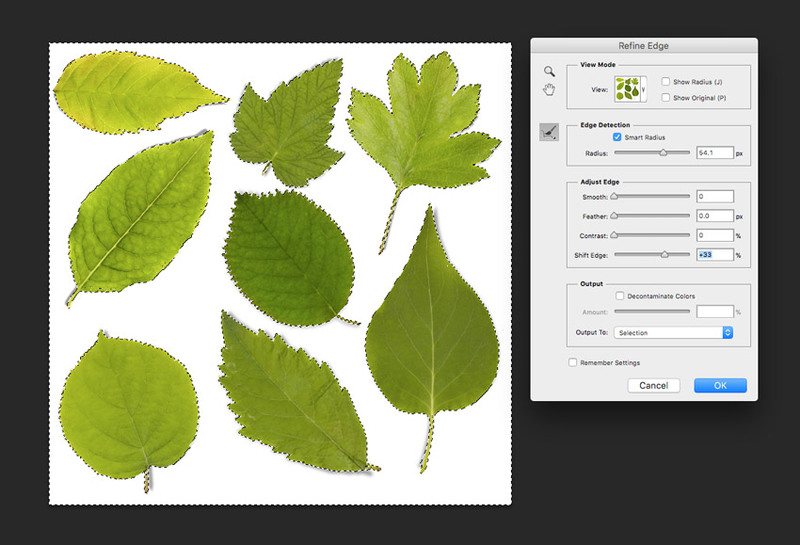 With the copy selected, go to File > Place and choose a different leaf PSD image. 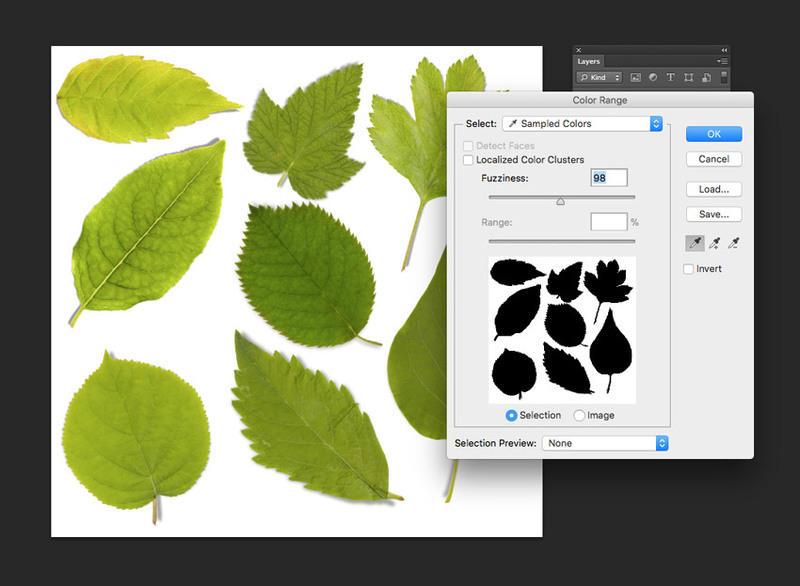 By adding the leaves this way, you can preserve the drop shadow settings for the image frame. 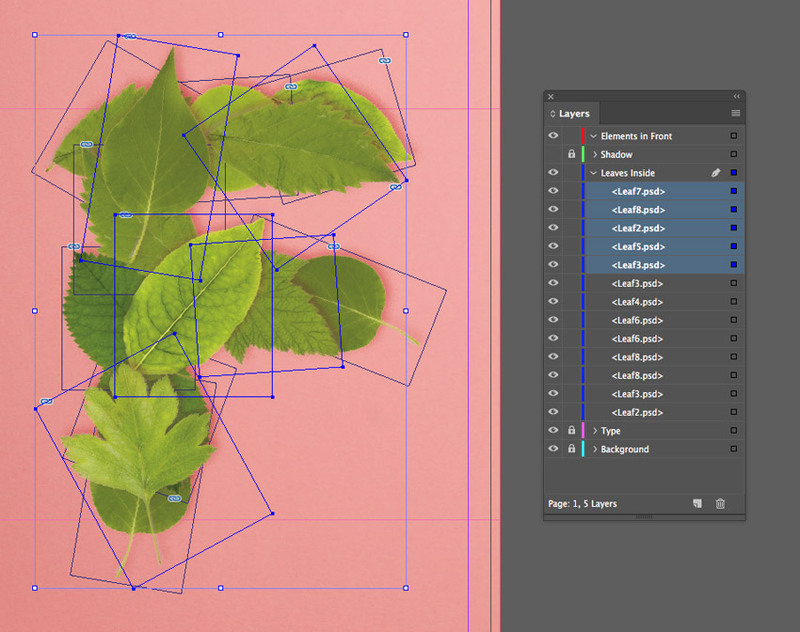 Continue to Paste new image frames onto the page, and File > Place to replace each frame with a different leaf image. Build the leaves up across the stem and arms of the letter. 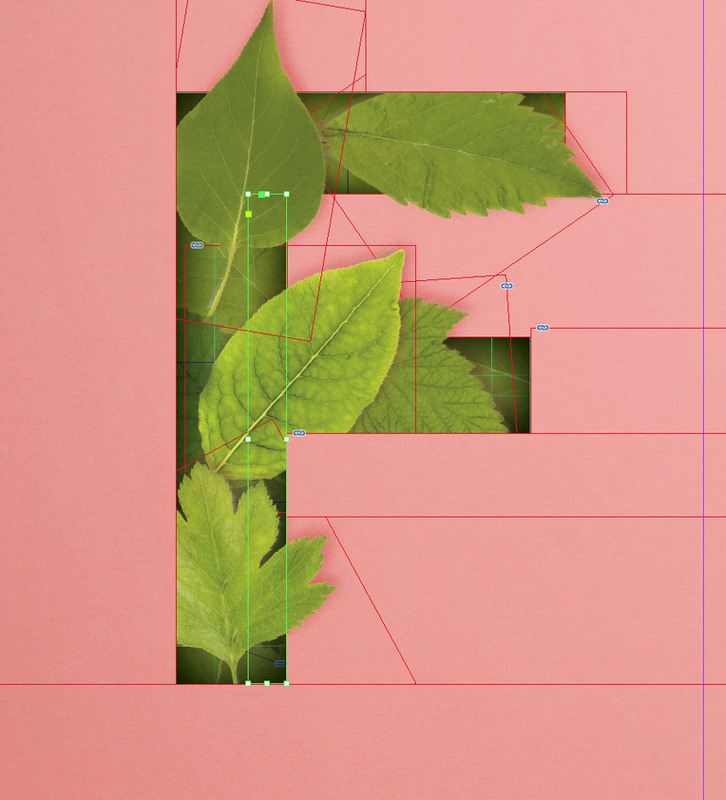 Once you’ve built up a dense range of leaves across the letter, unlock the top Elements in Front layer. 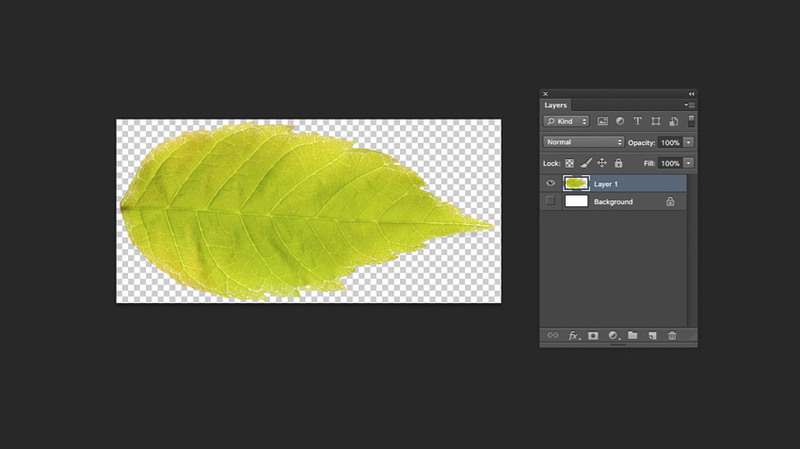 Then expand the Leaves Inside layer to view all the leaf PSD images sitting on that layer. Highlight the top four or five leaves. Then drag these up, dropping them onto the Elements in Front layer. Lock the Leaves Inside layer, and switch off its visibility. Keep the Elements in Front layer unlocked and active. Now we want to create blocks of pink texture on this top layer, to overlap some of the edges of the leaves and create the desired peekaboo effect. 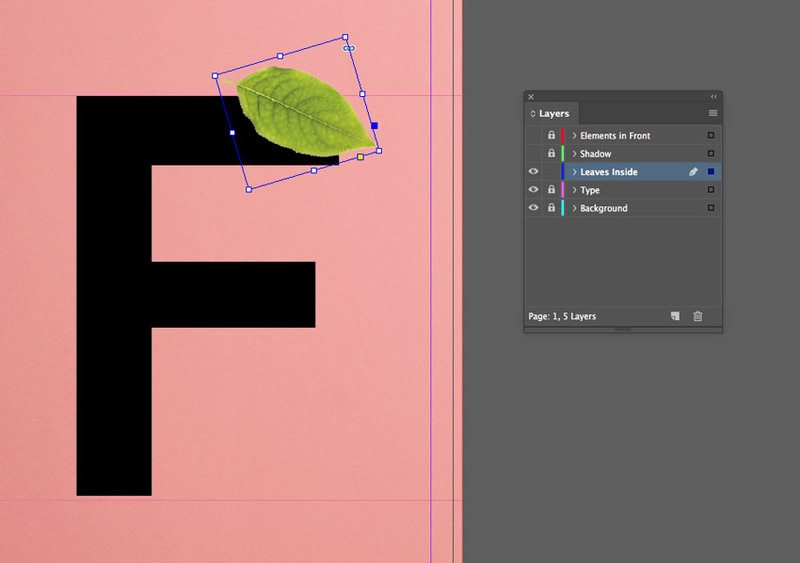 Use the Pen Tool (P) to mark off a section of the background, running the edges along the letter’s edge. Here, I want to disguise the top edge of the leaf pictured here, so that’s my focus for this block. 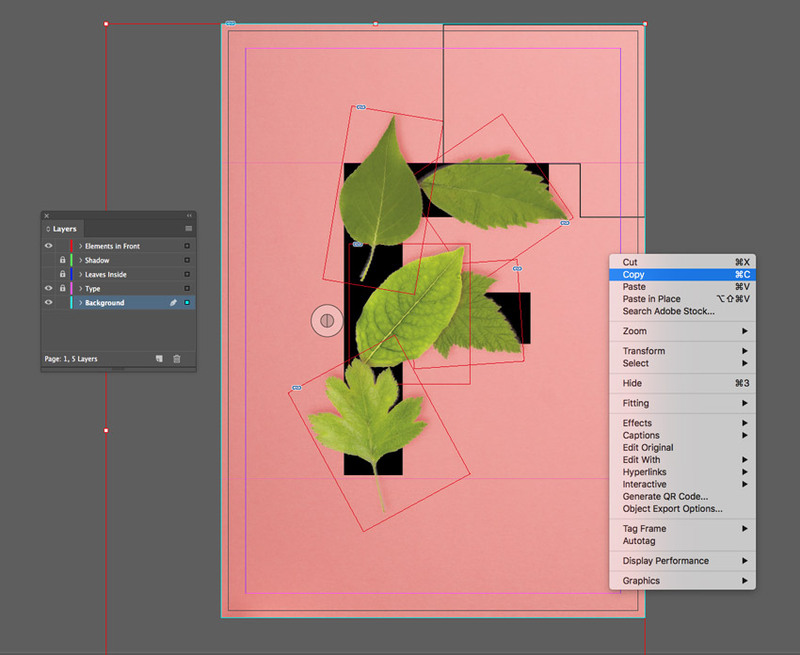 Then unlock the Background layer and double-click inside the large image frame sitting on this layer, to directly select the pink paper image. Then Edit > Copy the image. 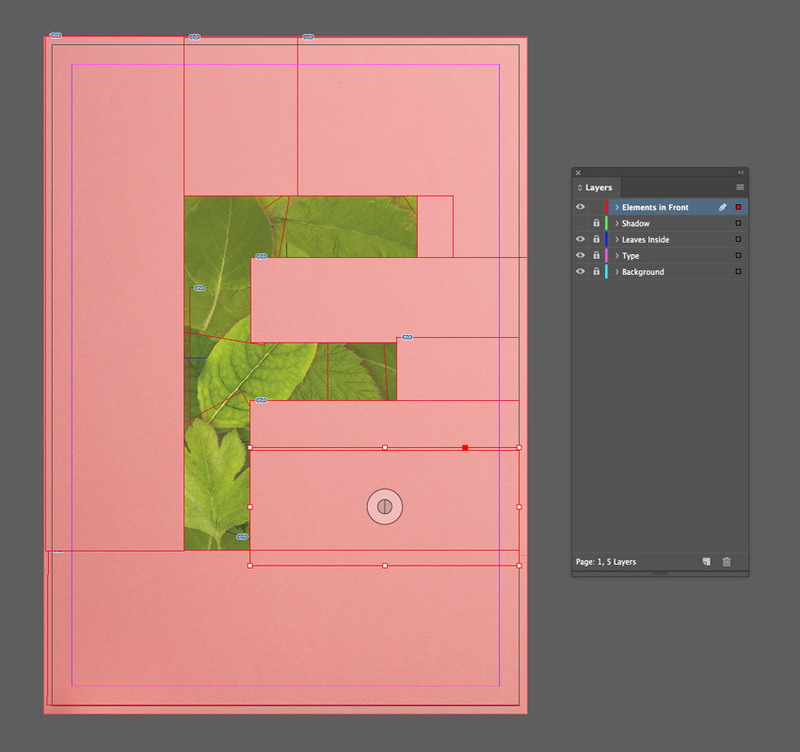 Lock the Background layer and go back to the shape you created on the Elements in Front layer. From the Swatches panel (Window > Color > Swatches), make sure the Fill and Stroke Color of the shape is set to [None]. 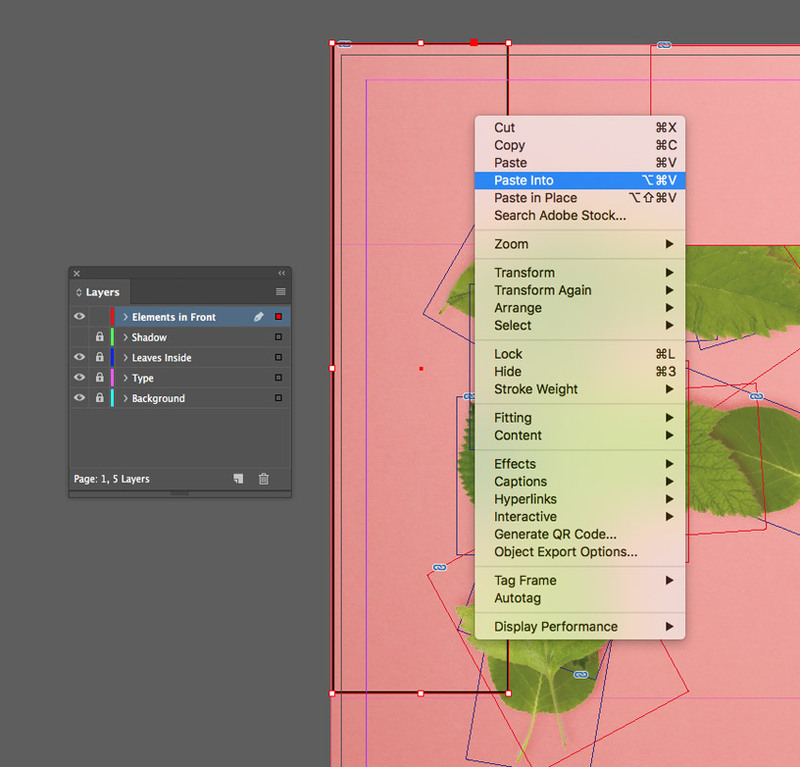 Then select the shape and Right-Click > Paste Into, dropping the pink paper image into the shape at the same scale as the background image. Repeat the process for another section of background. 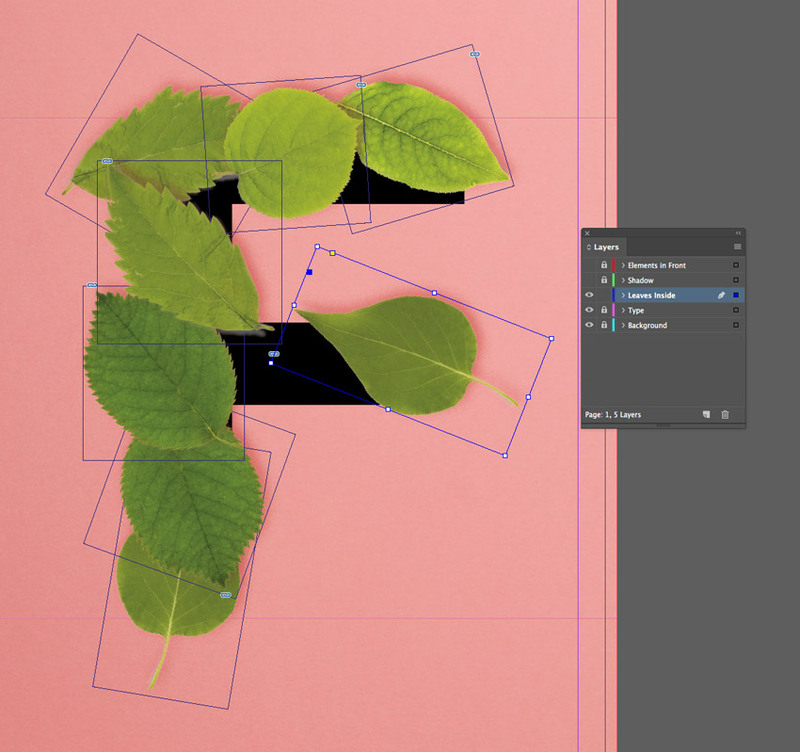 Use the Pen Tool (P) to loop off another area on the Elements in Front layer, before Right-Clicking > Paste Into the paper texture image into the shape, and then setting the Fill and Stroke of the shape to [None]. 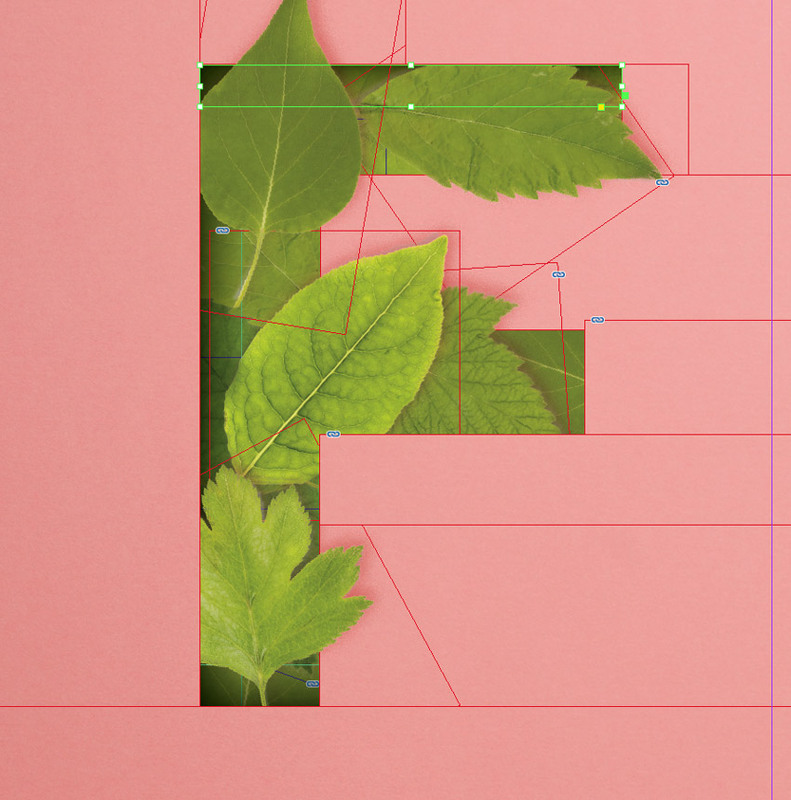 Keep building up shapes around the perimeter of the letter, and pasting in copies of the paper image. Do each bit in small sections, until the whole page is covered around the edge of the letter. 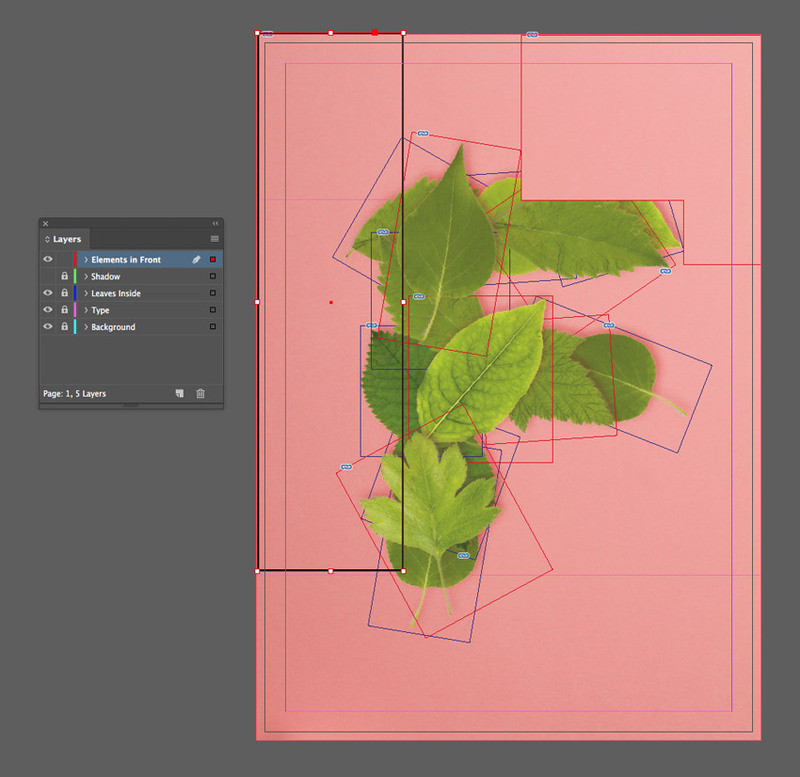 Now you can start to experiment with moving some paper-filled shapes in front of or behind the leaf shapes sitting on this layer. 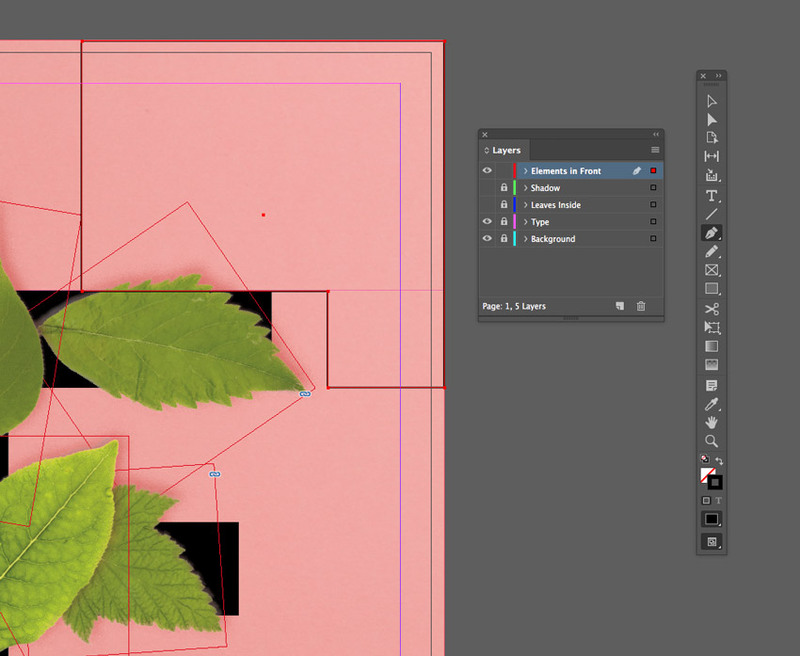 Expand the Elements in Front layer and try setting the group of leaves in the middle of two sections of paper shapes, allowing some of the tips of the leaves to poke out. This will take a bit of experimenting, so keep checking the result as you work. Lock the Elements in Front layer and unlock the Shadow layer. 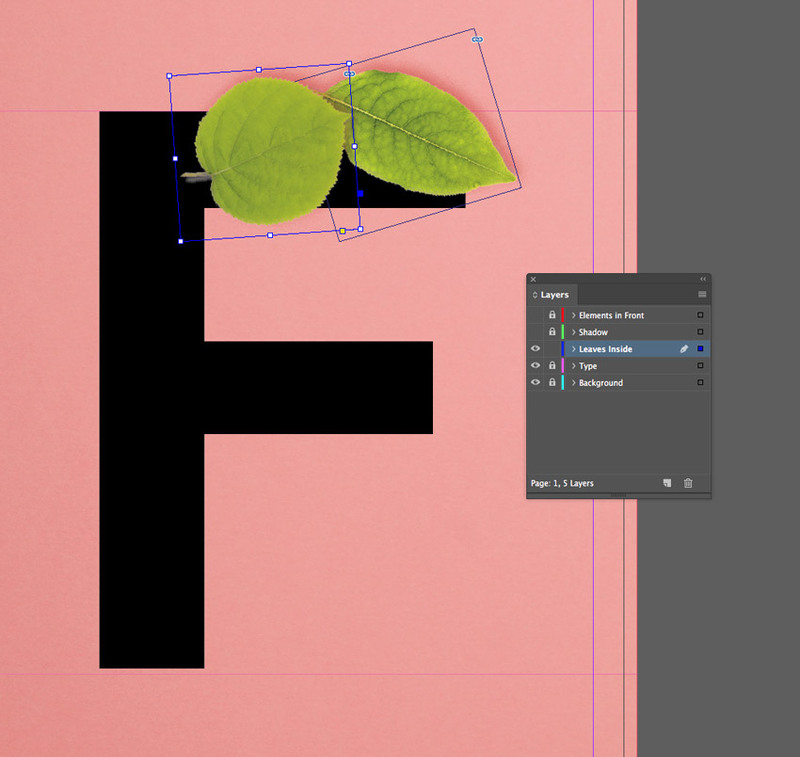 Use the Rectangle Tool (M) to create a rectangle shape over one edge of the letter, setting the Fill Color to [Black]. With the black rectangle selected, go to Object > Effects > Transparency. Set the Mode to Multiply and bring the Opacity down to 75%. Click on Gradient Feather at the bottom of the window’s left-hand menu. Keep the settings as they are, only reversing the gradient if needed, to allow the shadow to move from more opaque closer to the edge of the letter and more transparent towards the center of the letter. 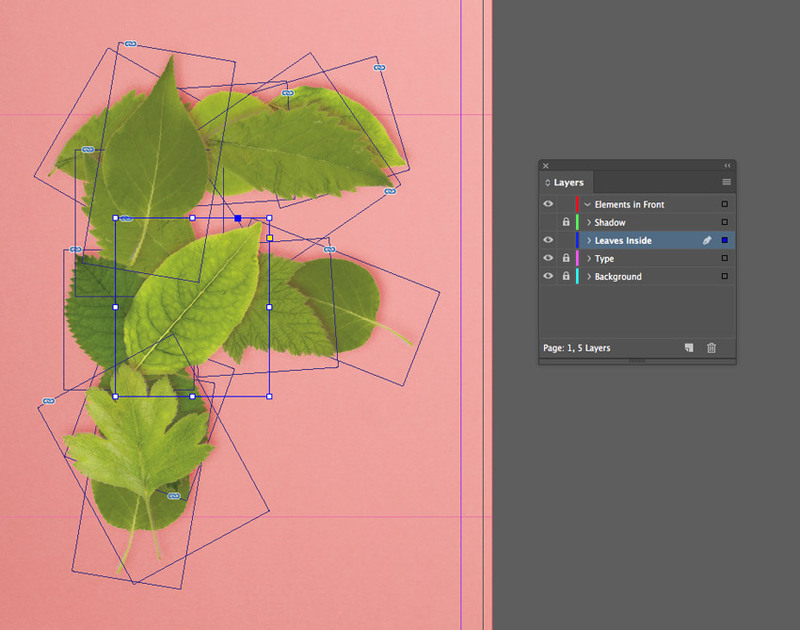 Select the rectangle shape and Edit > Copy, Edit > Paste it. 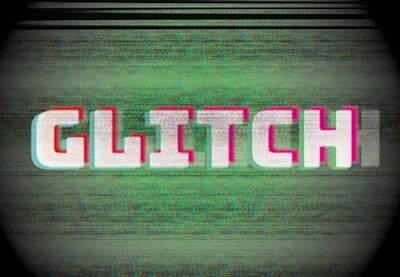 You might need to Right-Click > Rotate it and resize it to position it along another edge of the letter. 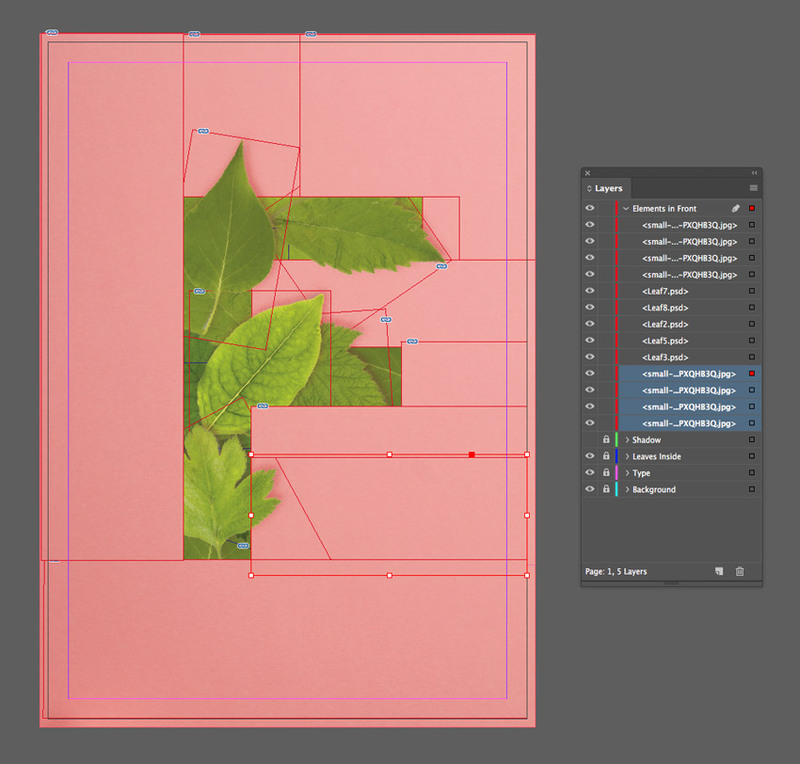 Continue to paste more rectangles along the edges of your letter, rotating and resizing each to fit. Eventually, you’ll have a shadow running along each edge of the letter, adding depth and drama to the whole effect. And your text effect is finished! Awesome job! You can now incorporate your text effect into other InDesign work, or go to File > Export to create a JPG, PNG, or PDF version of your effect. 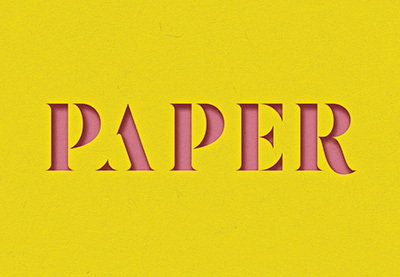 On the lookout for more great fonts to use in your text effects? 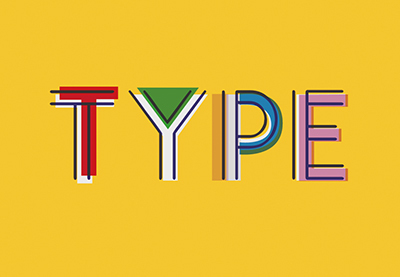 Head on over to Envato Elements to browse a huge range of awesome display typefaces.